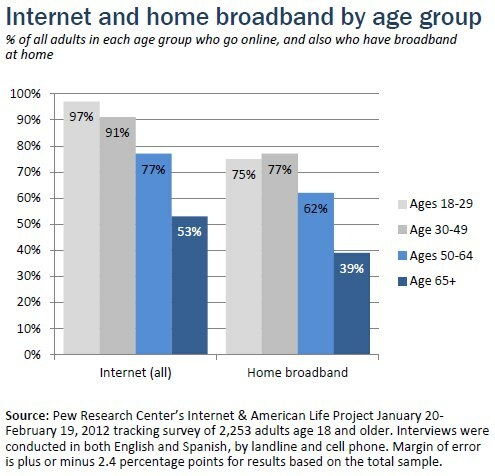 As of April 2012, 53% of American adults ages 65 and older use the internet or email.9 Though these adults are still less likely than all other age groups to use the internet, the latest data represent the first time that half of seniors are going online. After several years of very little growth among this group, these gains are significant. In August of 2008, 38% of adults ages 65 and older were online; by August of 2011, the share of seniors using the internet or email at least occasionally had barely inched up to 41%. However, by February of this year the number of online seniors had bumped up to 48%. In the latest survey, 53% said they used the internet or email. Among the next oldest age group that we commonly examine, adults ages 50-64, almost eight in ten (77%) use the internet, a proportion that has remained relatively steady over the past three years. Overall, 82% of all American adults ages 18 and older say they use the internet or email at least occasionally, and 67% do so on a typical day. Once online, internet use becomes a regular part of seniors’ lives. 87% of the internet users ages 18-29 who go online on a typical day. Looking more closely at the “G.I. generation” (those who are currently ages 76 and older) reveals a starkly different reality. 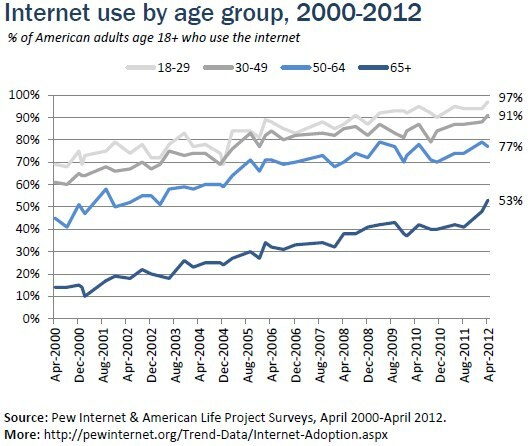 Internet adoption among this group has only reached 34% as of April 2012, and home broadband use has inched up to 21%. 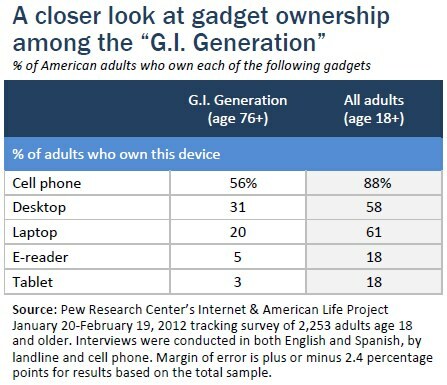 Desktop ownership among seniors has been steady over the past couple of years; 48% now report having desktop computers, compared with 45% in 2010. 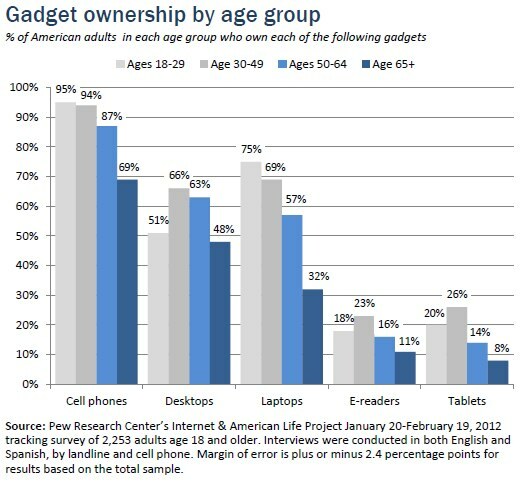 Laptops, by comparison, have grown in popularity; 32% of adults ages 65 and older now own them, up from 24% in 2010. One in ten seniors own an e-book reader, up from 3% two years ago. Having e-book readers like Kindles and Nooks is still the exception rather than the rule among the senior population. However, almost four times as many seniors own e-book readers now as did just two years ago; 11% reported owning them in the most recent survey, compared with just 3% in 2010. Tablet ownership is also growing; 8% of seniors have them, up from 1% in 2010. One in three online seniors uses social networking sites like Facebook and LinkedIn; almost nine in ten use email. 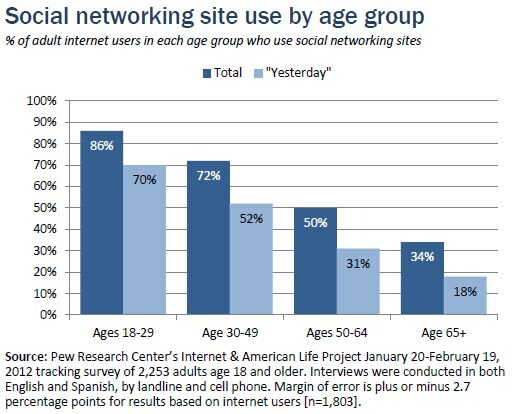 As of February 2012, one third (34%) of internet users ages 65 and older use social networking sites such as Facebook, and 18% do so on a typical day. Among the G.I. Generation population (adults who are currently ages 76 and older), 20% of the internet users in that cohort use social networking sites and 8% do so on a typical day. Among all adult internet users, 66% use social networking sites, and 48% use them on a typical day. Meanwhile, email use continues to be the bedrock of online communications for seniors. 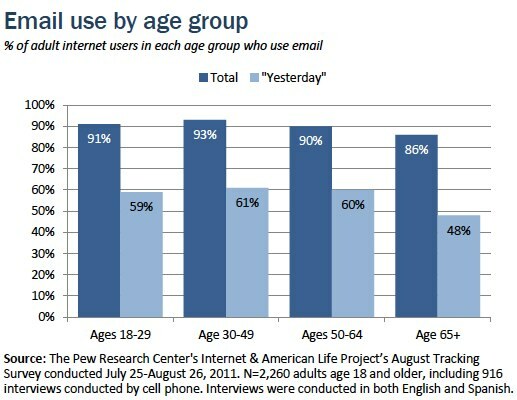 As of August 2011, 86% of internet users ages 65 and older use email, with 48% doing so on a typical day. Among all adult internet users, 91% use email, with 59% doing so on a typical day. Older adults’ motivations for using social media sites differ from those of younger adults. For instance, for adults over the age of 50, staying in touch with family is the number one reason they use social networking sites. For adults under age 50, staying in touch with friends is a bigger motivation. 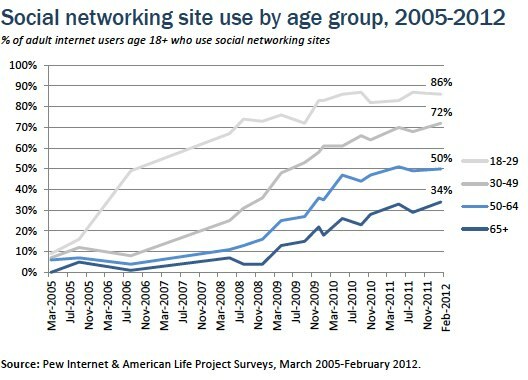 For more on why people use social media, see “Why Americas use social media” (2011). For a lengthier discussion of older adults and social media use, see “Older adults and social media” (2010).